From injuries to necessary surgeries, getting the help you need after an operation can be difficult. More often than not, the responsibility places a heavy burden on your loved ones and the life altering after effects can also result in post-operative depression. FirstLight Home Care Rehabilitative Care can offer assistance for injured senior adults and those who need additional service to enhance their quality of life. For injured adults or those coming out of the hospital, rehabilitative and post-operative care is more than just physical therapy. Instead, it’s a personal service designed to help individuals recover and restore their confidence and independence. Time to heal: Being able to devote time and energy to healing can be tough when also dealing with the daily responsibilities of life. Post-operative care offers that time by having a professional caregiver come in and tend to needs in the home and other errands so the focus can be on recovery. Time to bond: For recent mothers, spending time with the baby is critical for bonding and future development. However, after leaving the hospital and returning home, the needs of the household can make it tough for quality bonding to take place. Post-operative care works as a way to help new mothers spend time with their child and ensure daily chores get accomplished at the same time. Time to rejuvenate: Physical health improvements have routinely been linked to stronger emotional health. 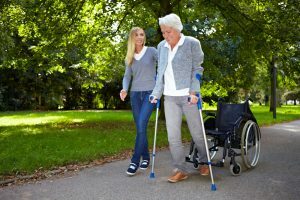 Rehabilitative services can help injured loved ones concentrate on becoming physically active again to become more accepting of their condition and in turn, improve their emotional well-being. If you or your loved ones have been injured, are recovering, or recently returned home from a surgery, working with a post-operative care specialist can help regain confidence faster to improve overall well-being with FirstLight Home Care Rehabilitative Care. To find out more of the benefits of rehabilitative care, contact your local FirstLight Home Care location today.